This year’s list covers many vital subjects, from a discussion of Piketty’s Capital in the 21st Century to the impacts of the ANZAC legend on modern defence policy. The list includes a candid look at women, men, family and work, an argument for constitutional recognition of indigenous Australians, and the post-mortem of a spectacular political defeat. Capping off the list is this year’s must-read novel, a seamlessly shifting blend of poetry, pathos and humour from one of Australia’s finest story-tellers. Watch a recording of the launch event in Melbourne or listen to a podcast of the event in Sydney to learn what informed our choice of the works on the list, and what messages government can take away from them. 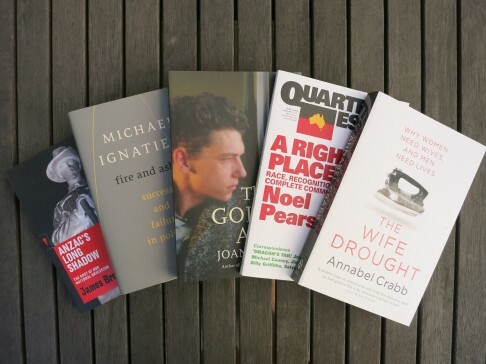 ABC Presenter Geraldine Doogue will join Grattan Institute CEO John Daley in Sydney, and Helen Silver, former head of the Victorian Public Service will join John in Melbourne to discuss how these titles illuminate some of Australia’s biggest debates. This year we are proud to publish our list in partnership with Readings – an Australian independent retailer. The books can be purchased at Readings’ table at our Melbourne launch, any of Readings five shops in Melbourne, or via Readings online with free delivery on orders $19.95 and over anywhere in Australia.